By clicking “Shop now” you are agreeing to leave the VISUfarma.co.uk website and be directed to our online web shop. 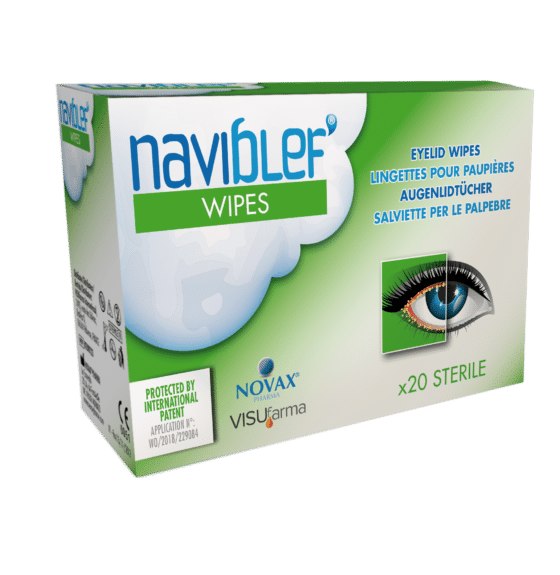 NaviBlef Wipes are composed of a non-irritant formulation for the removal of ocular secretions and debris from eyelids and eyelashes caused by a variety of ocular conditions. May also be used post-cataract surgery. The recommended usage of NaviBlef Wipes varies according to severity of infestation. See package insert for full instructions for use. NaviBlef Wipes come in a box of 20 sterile wipes. Is there anything we can help you with? From requesting a product sample, arranging a visit from one of our helpful customer representatives, or simply asking us a question about VISUfarma products. Use the form and we’ll be in touch as soon as possible. By clicking “Buy now” you are agreeing to leave the VISUfarma.co.uk website and be directed to our online web shop. By clicking “Go” you are agreeing to leave the VISUfarma.co.uk website and be directed to our global website.